For my ears Bernarda Fink is obviously not German, though her diction is excellent. This is hard to explain. The phrasing is beautiful but not exactly German. I'm told she is from Argentina. If I turn the sound down to the point where it doesn't hurt my ears, I can hardly hear the piano. This is an engineering issue. Engineer also must insert a bit of dead space at the end of each song so you can tell when one stops and the next one begins. This problem is worse because of the first item. Her voice is very sweet, but the tone does not vary much. There are songs here I haven't heard in years: "Ganymed," "Die junge Nonne," "An Silvia." She never gets really carried away. 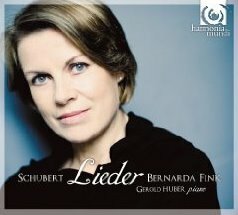 I apologize for not buying something more current, but I really love Schubert.